*NOTE: Valiant can print any number of copies they like, but they do announce incentive ratios via Previews and the monthly sales numbers are shown on Comichron.com. The calculations used to make this list are to determine what portion of Comichron.com sales numbers are likely to be non-incentives, then to apply the Preview incentive ratios to the non-incentive portion of the monthly Comichron number. 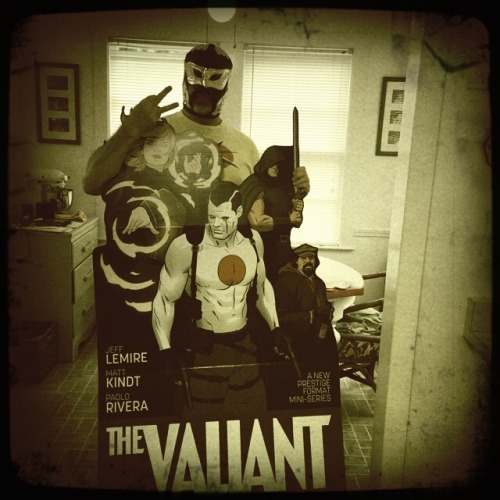 It is likely that Valiant printed more copies than what is calculated because the calculation is for the first month of North American sales, not for worldwide orders. Additional copies are printed to allow for damages and for Valiant internal use (such as providing to artists, writers, etc.). Simply stated, this is all the information we have available that can be used to create a list like this. The calculation for Divinity #1 1:40 is 257 copies (#53 in the list), while Dinesh has stated that the print run was 350 copies. Perhaps that gives us some idea of the amount of extra copies per book. The Valiant 4 1:50 and Shadowman 13 1:50 are looking pretty collectible. Right, the intersection of this list with the list of keys (or at least, what we hope will become keys) is a very interesting place to watch the Valiant market. I might or might not have just gone on eBay and snapped up some 1:50s. Thanks for the great work Greg! My first book doesn't show up until #17. Last edited by rentu on Tue Feb 09, 2016 10:02:37 am, edited 1 time in total. Yeah, I was just thinking about this the other day when I was perusing the numbers on Comichron. Even the 1:20 copies of books such as Imperium and Ivar are pretty darned limited due to the unfortunately low sales numbers on some of those titles. Of the current books being published, I'd say any 1:50 copies, other than the first issues, which tend to sell much higher, are going to be severely limited. I figured Wrath of Eternal Warrior #3 would be very low (it's #7 on the list) as well as the Bloodshot Reborn #10 1:50. What about the Bloodshot Reborn #10 1:100 linewide variant? I don't see it on the list but I have to figure that is pretty scarce. Any idea how to calculate the numbers on the linewide variants? Thanks for putting this together. Very useful information here. Sure, the linewide variants are based on all Valiant sales in that month. Bloodshot Reborn #10 1:100 linewide variant is based on the January sales of 67,000 Valiant books. It's around 670 copies. But doesn't that assume every store that ordered any part of that 67k ordered at least 100 issues? Same problem with all the incentive variant calcs, no? It assumes that only a small percentage of stores met the max copies and the numbers are the maximum amount of incentives that could be produced. A couple years ago, it was reported there were about 2600 comic shops in the U.S. If all shops ordered equally, that's only 26 copies per store, so no one would get incentives. In order to get 670 copies of the Linewide out there, only 25% of all the stores in the U.S. would be buying all the Valiant comics. That leaves only 150 stores to get 103 copies, so there'd only be 150 of the 1:100 Linewide allocated. That leaves 275 stores to get 102 copies, so there'd be 275 of the 1:100 Linewide allocated. Last edited by SwiftMann on Tue Feb 09, 2016 9:34:19 am, edited 1 time in total. Don't forget incentive variant pre-orders by DCBS, TfAW, and/or Impulse Creations. A person willing to order 10x of a 1:100 variant for $1,000 can certainly do so, and in the process those online retailers will have an extra $1,000 books to sell over time for profit (since they already made their money by selling not th 10x 1:100's). I suspect more than a few of the variants are obtained this way. Valiant is printing all of the ratio incentive variants, whether they are earned or not. Valiant needs the extras for damages and for giveaways (to the artist, writer, etc.) or file copies. What actually happens to those extra books isn't known (if there are leftover extras), but it is the same sellers every month on Ebay (the same dealers) who have multiples of Valiant incentive variants... making it pretty clear that they buy a large bulk of Valiant books. The linewide books are easier for a dealer to obtain, because 100 of all the Valiant books (there are 7 to 9 titles per month) is an average of 12 to 15 copies per title. Meanwhile, Bloodshot Reborn #10 1:50 variant required ordering 50 copies of Bloodshot Reborn #10. I wasn't questioning whether or not they exist. Just saying the numbers provided are the maximum possible calculated copies and not necessarily representative of what will be found "in the wild." "maximum possible calculated copies" doesn't sound right. These are the calculated copies based on North American sales in the first month. If we had the worldwide sales for all months, we'd have higher sales numbers, and we'd have higher calculated copies. A good example is Divinity #1 1:40 variant, stated by Dinesh to be 350 copies, but only calculated to be 257 copies. So, 257 can't be the "maximum possible calculated copies". There are two variables at play... one is that retailers might not earn all the copies (meaning there are fewer), but the other is that the total numbers are higher than first month North America numbers (meaning there are more). Practically speaking, however, there aren't many recorded sales for these books after the first month's North American copies are initially sold. So far, the market window is short and then it's a drought. Actually 257 is exactly the maximum possible calculated copies. You can't calculate more based on the information in hand. The fact that there are 350 printed doesn't change that. Or if, hypothetically, only 150 were actually sent to stores. I'm not saying the numbers as a whole don't show trends and possible rarity, just the numbers themselves are loose estimates at best. Just like icv2's (which comichron seems to be aping). eBay has one or two as part of a package set for like $120. Seems like this book has vanished. Interesting... I bought one today at $25. I just picked up a copy online from Midtown. They have at least one more after my purchase. Go get it! I picked up the last one from Midtown Comics. would it be able to list the book and have a link or picture to the cover? Ironically, I got out of it partially because of the variant madness, but mostly because of the lack of contiguous, ongoing series. Yes. I'm trying to combine the Previews/Comichron data with the ValiantFan.com regular database (and do updates), so it may be a while. http://www.valiantdatabase.com (run by Martin Ferretti) does have these covers.